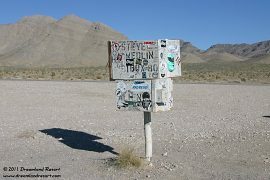 The famous Black Mailbox is the spot where UFO watchers like to gather at night, to search the skies over Groom Lake for UFOs and other mysterious lights. It is located on Hwy. 375, between mile marker 29 and 30, on the southwest side of the highway. But it's not even black any more?! A new conspiracy? Relax, the answer is much more mundane. Contrary to a common misconception it is not the mailbox of Area 51, but it belongs to a local rancher, who owns the only ranch in Tikaboo Valley. 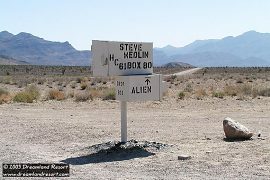 He often found tourists going through his mail, hunting for top secret Area 51 documents. Story has it that his mail even had bullet holes several times. So he installed a new bulletproof white mailbox, with a lock to keep curious "researchers" out. The original box was auctioned off in 1996 to a UFO fan for $1000. The dirt road leading south from the highway here is called Mailbox Road. 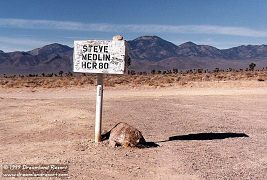 It intersects after 5 miles with Groom Lake Road, which leads into the base. For details see our Tikaboo Valley Map. The area around the Black Mailbox is a good spot to pull off the road and watch the skies, or even to camp for the night. There is a good level spot just off Mailbox Road to the right, when you pull in from the highway. Please do not camp right in the intersection and make sure that you do not block the access to the mailbox or the dirt road when you camp there. During the summer months, especially on weekends, there is a good chance that you will meet some fellow watchers there at night. Please see our Watchers Etiquette for some sky watching tips. Update 08/2014: The Aliens apparently packed up and left and beamed up their Mailbox... :-) As of August 15 the white Black Mailbox at the intersection of Hwy 375 and Mailbox Road is gone.